Chicago’s tallest building may be on the market, and it might even have a buyer. Crain’s Chicago Business reporter Ryan Ori said Tuesday that the owners of the Willis Tower have hired Eastdil Secured to seek a sale of the 110-story tower. Real estate mogul Joseph Chetrit, developer Joseph Moinian and Skokie-based American Landmark Properties could fetch as much as $1.5 billion—a sum that would dwarf some of the eye-popping price tags from 2014. The current owners also broke records when they bought the tower in 2004 for $840 million. It’s another sign of the real estate resurgence for downtown properties. Consider the $850 million deal to nab 300 North LaSalle Street, or the record-breaking sale of OneEleven. Completed in 1973 as the Sears Tower, the building was the world’s tallest for 23 years until Kuala Lumpur’s Petronas Towers outreached Sears by a hair. Willis got its current name in 2009 as part of an agreement with London-based insurance broker Willis Group Holdings, though many Chicagoans steadfastly refer to it by its original name. 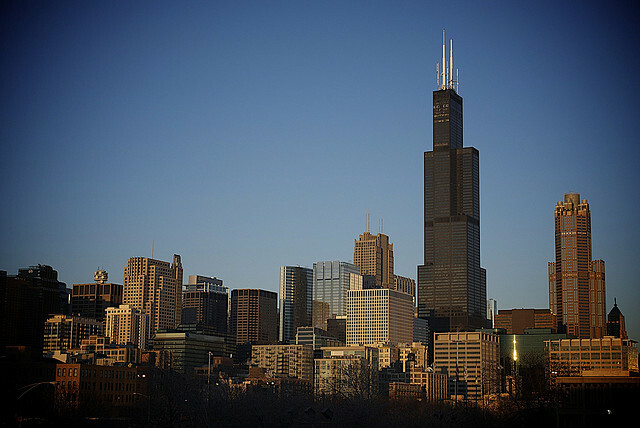 Designed by Bruce Graham and Fazlur Rahman Khan of Skidmore, Owings & Merrill, the building’s powerful silhouette and distinctive expression of its bundled-tube structural system have made it a defining feature of the Chicago skyline. Willis is currently 84 percent leased. Its two largest tenants are United Airlines and law firm Schiff Hardin, who both have their corporate headquarters there. If the deal goes down, future owners would likely explore ways to lease new space—occupancy has risen in recent years as downtown neighborhoods have begun to attract more jobs and residents.